Kimi Raikkonen's return to the wheel of an F1 car this week heralds an unprecedented season in the sport with six World Champions on the grid. To get the former Sauber, McLaren and Ferrari driver gently re-introduced to the idea of driving at speed, without someone sitting next to him yelling notes, Lotus arranged a special test for him at Valencia over Monday and Tuesday.The team trotted out a 2010-spec Renault fitted with Pirelli control tyres for Raikkonen to have his 'millionaire's track day'. Or two. 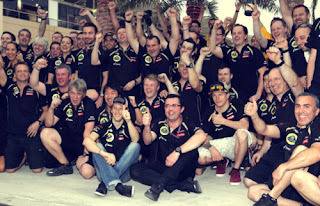 At the end of it Lotus's very experienced Operations Engineer, Alan Permaine, reckoned he'd acquitted himself well and had gained speed over the 171 laps - in excess of two race distances.Speaking on Tuesday he said: \"Kimi's pace improved from yesterday as we would expect and we completed several start, pitstop and clutch simulations. We were even able to finish early as we completed our programme ahead of time. Overall it has been a productive and valuable two days.\"But then again he would say that. There are some very divided opinions in the pitlane about whether Kimi's return to F1 after a two-year break spent rallying is a good idea or not. Many point to the fact that even the god-like genius of Michael Schumacher has found it tough adapting back to the sport. With Michael there is no atom of doubt about his absolute motivation and his commitment to being both physically fit and to work long hours to analyse and perfect. Yet still he's struggled.The first season back was a surprise that he rarely beat Nico Rosberg until it was diagnosed that the front tyres and the turn-in of the Mercedes was not how Michael liked it, wait till he got the W02 in 2011. And that was an improvement, but still he was regularly outqualified by Rosberg, only coming into his own with a series of megastarts that often had him right up with his team-mate again on the opening lap.So the logic would say that if the winningest grand prix driver of all time with a single-minded devotion to compete can't reproduce his form of old, then Kimi won't. Raikkonen was expensively bought out of his contract a year early by a Ferrari team dissatisfied with the Finn's motivation and his 2009 performance.Raikkonen's drives were sometimes reminiscent of some of his compatriot, Mika Hakkinen. When Hakkinen expected to do well in his Mclaren days and got relegated down the order for reasons out of his control he would sometimes show a distinct lack of interest in improving and put his car into cruise control. The antithesis of this would be Fernando Alonso who never ever stops trying. 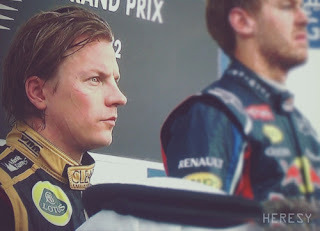 His outburst towards the end of the Korean GP \"I give up!\" was one of the biggest shocks for the season. And he didn't really.But there have been doubts over Raikkonen before that have been proven wrong. When he was first hired to drive for Sauber there were those who thought that Peter Sauber had made huge mistake by choosing someone who had just 23 single-seater races and had only driven in the two-litre Formula Renault. FIA boss at the time, Max Mosley, was all for withholding his superlicence, but Kimi scored a point with sixth place on his F1 debut in Australia in 2001 and the critics began to be persuaded.He is a remarkably adaptable driver. While many F1 stars dabble in the occasional rally appearance none has even won a stage in a modern WRC event. Raikkonen has. That adaptability was also proven by a Lazarus-like performance in atrociously wet conditions at the 2007 Japanese Grand Prix when the two Ferraris were forced into making an early pit-stop to change tyres and for a lot of the race he looked mathematically out of the World Championship - at what was the third last race. He eventually hauled himself up to third place on the podium on a day when many cars were crashing out all around him.And Lotus aren't exactly taking a massive gamble by employing him. The best unplaced driver for this season is Adrian Sutil, and given that he will be appearing in court shortly on a charge of attacking one of the Lotus bosses, his chances of a race seat at Enstone were never better than hopeless. Rubens Barrichello would be an experienced driver with a good track record of setting cars up, but then again so was Nick Heidfeld. The team clearly want a spark of genius rather than someone solid to bank points.Raikkonen's biggest drawback, as he himself has pointed out, is not his fitness or his familiarity with a combination of KERS and DRS, it is lack of experience on Pirelli tyres. That more than anything else might hold up his progress in the first half of 2012. As he is bound to be judged against Romain Grosjean, it's fortunate that the Frenchman has only limited experience on Pirellis as well.One very interested spectator on how the former World Champion copes with the situation is likely to be Robert Kubica. Assuming all goes well with Robert's rehabilitation in 2012 we might see him back in a car in 2013. Kubica will have exactly what Raikkonen has, a two-year layoff to contend with in which the cars have evolved considerably, and gained the mysterious Pirelli tyres.The man who Fernando Alonso believes to be faster than him has all the technical change to cope with, plus tyres, plus a re-attached hand to bolster and protect. 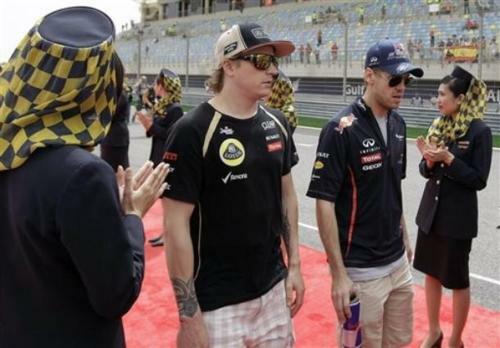 So if it's going to be hard for Raikkonen, imagine how much harder it will be for Kubica.It will be good to have five World Champions line up on the grid in Melbourne and while Kimi may not be known for articulate explanations of his race performances or spend that extra hour in the gym - which of those six champions has dressed up as a gorilla and competed in a powerboat race? Or has a \"nice\" ice cream during race delays? Or heads up the hill from Eau Rouge into a wall of blown-Honda-engine smoke and keeps his foot in. There's only one Kimi Raikkonen, let's celebrate, he's back. - You will have Grosjean as teammate: would you prefer a more expert teammate? KR: The rules are different to a few years ago, and you don’t necessarily have to be on pole to win. We’ll try, but I can’t predict what will happen; it’s very difficult to say before the weekend starts. 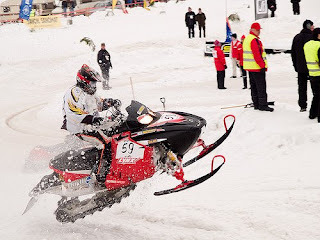 The teams are very close, so if everything goes smoothly then we can be right up there, but small difficulties in any area and you’re suddenly much further back. We will know for sure on Sunday. If we’re top that’s great; if we’re not then there’s still work to do. I think we have a good package and we have a good chance this weekend. 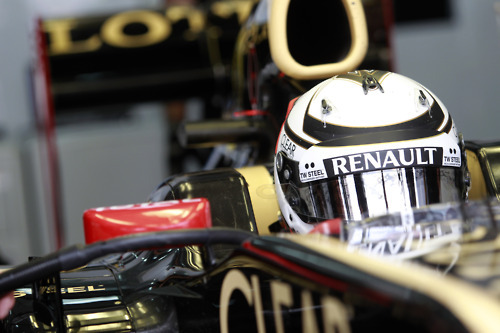 ROMAIN – HOW MUCH DO YOU THINK YOU HAVE PROGRESSED AS A DRIVER THESE PAST FEW MONTHS? RG: The more racing I do the more I progress. There is still room for improvement, but racing among top drivers helps me to learn and to develop. Formula 1 is very challenging, and sometimes we don’t have much time to get everything right. It’s rare to have a perfect qualifying session, a perfect race start, a perfect first lap and then a perfect race… that’s why I work on continuing to progress and become a better driver. BOTH – BARCELONA IS THE FIRST EUROPEAN RACE OF THE SEASON – ARE YOU PLEASED TO BE BACK? KR: I prefer racing in Europe, but I arrived in China on the Thursday morning so arriving for a European race on the Thursday morning is no different really. RG: It’s good to be back in Europe. I’ve seen a lot of people I know, my old colleagues from GP2 for example, and there are a lot of media attending this first European race. It’s also great to see the many Spanish fans. We’re looking forward to the weekend here and hopefully it will be a good race. KIMI – YOU DIDN’T TEST AT MUGELLO AS APPARENTLY THE TEAM HADN’T BROUGHT MAJOR MODIFICATIONS, BUT FOR THIS RACE THERE ARE A NUMBER OF UPGRADES; DO YOU THINK THE E20 CAN MAINTAIN THE SAME LEVEL SHOWN IN THE OPENING ROUNDS? KR: The team is happy with what they achieved in Mugello and I didn’t need to be there. There were some question marks in certain areas of the car and the test allowed the team to sort these areas out so it was worthwhile. We’ll see how much of a step forward we have made once we take to the track here in Barcelona. ROMAIN – ARE YOU HOPING FOR THE WEATHER TO STAY SUNNY AND WARM LIKE IT IS RIGHT NOW IN BARCELONA FOR THE RACE? RG: There’s nothing we can do to impact on the weather! If it’s raining we’ll have the wet weather tyres on the car but I think that broadly speaking everybody prefers sunny weather – even the fans that come to watch the races. We’ve seen that the E20 works well in more suitable conditions like what we have right now and I hope that it stays the same. If it rains, then it rains. The car’s not bad in those conditions either! Q: Why do you always wear a cap and sunglasses, even when there is no sun? 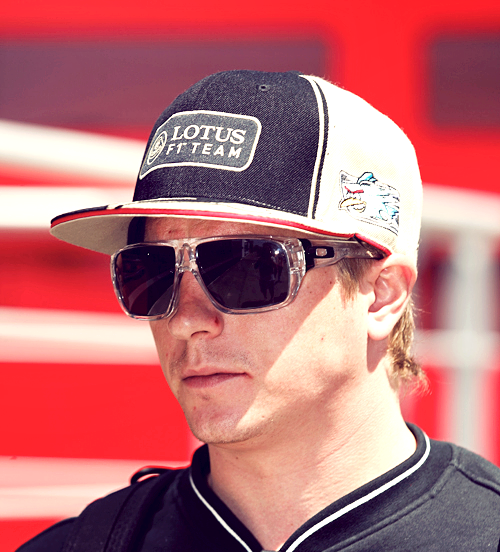 Kimi: I like caps and I like sunglasses. I have very sensitive eyes so I have to protect them with the sunglasses. Q: Have you ever got something special from your fans? Kimi: I receive a lot of gifts from fans… they can be really inventive and it makes me smile. They remember my birthday, they send their congratulations and their supporting slogans in Finnish. That’s something special, isn’t it? Q: Why you don’t have a twitter account? 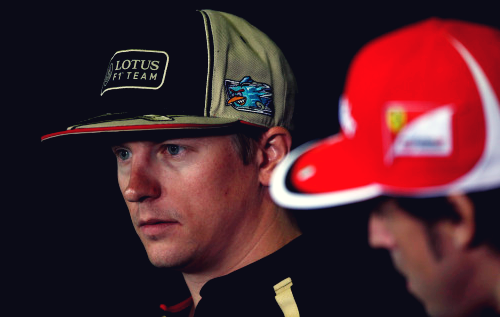 Kimi: Well, I don’t really like twitter... or facebook. I prefer privacy. 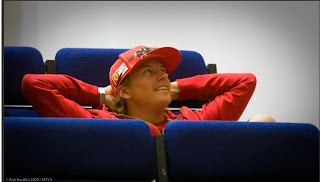 Q: What will be your revenge against Sebastian Vettel after what he did on the podium? Did you see the pictures? 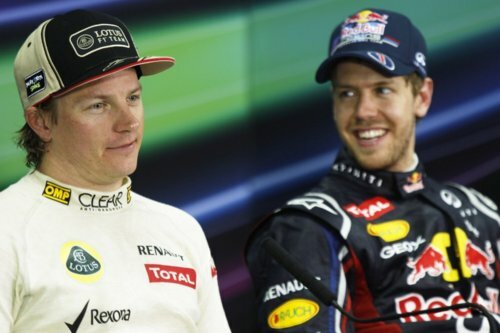 Kimi: Yeah I saw that, it was funny. The revenge will come soon enough, I hope! Getting on the first step of the podium would be a good start. Q: Who’s better at badminton, you or Sebastian Vettel? 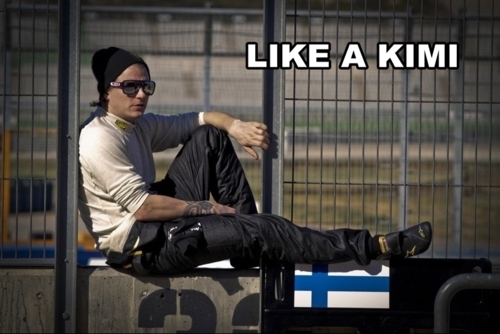 Kimi: I keep on winning! It’s something like 100 to 0 so far... Q: What situation makes you nervous on the race track? Kimi: If somebody is doing something really stupid. But luckily right now the grid is very talented! Chocolate or Strawberry? - Ask Kimi! Q: What ice cream flavour do you like most? 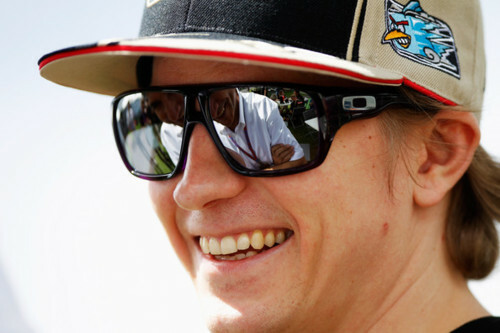 Kimi: [smiles] There is no specific flavour… vanilla, chocolate, strawberry the traditional Finnish ice cream flavour – whatever is available. Q: What was your first car and what do you have in the garage these days? Have you still got the Enzo? Kimi: It was a Lada, a used one. I had good fun with it. I haven’t got the Enzo anymore but I have a nice Lotus Evoras S, which is a really good compromise. Q: What kind of music do you listen to and who is your favourite singer / band? Kimi: Most of all I like the music the Finns play. I also like Linkin Park, I think they’re cool. Q: How would you know if you have done a perfect lap? Kimi: There is not a perfect lap, only in dreams. You can get a great lap without any mistakes, but you can always improve it, believe me! According to Kimi Räikkönen it's much more nicer in Lotus than it was in Ferrari and McLaren. Kimi Räikkönen doesn't miss his boss Ron Dennis from his McLaren-times or Ferrari's boss Luca di Montezemolo. He is already sure that the working peace between the driver and the team will maintain better in Lotus. - This is a relaxed team. Much more homey and warmer than Ferrari or McLaren. 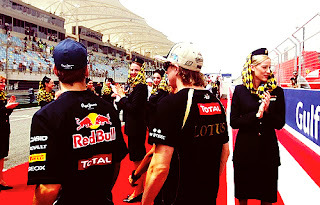 So far I have had really fun with the crew from Lotus and I don't think that the situation will change, Räikkönen said yesterday. Lotus is getting a new F1-simulator. - It's going to be better than any other team has. I myself am not going to drive a lot in the simulator. Even if I would drive in the simulator all days I don't believe it would give any advantage in the final games. 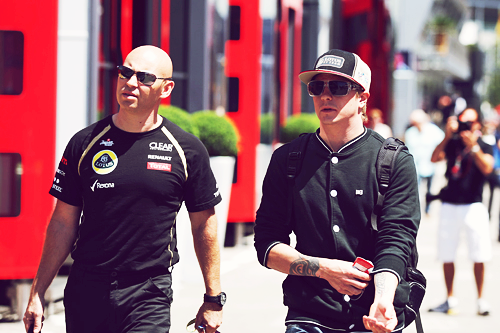 Räikkönen is still trying to get permission from Lotus to drive some rallies this year also. - One can get injured in normal life also but it's understandable that the team is trying to protect their drivers from dangerous hobbies. Maybe we can still reach unanimousity about the rally-matter at some stage. It is still possible that Räikkönen would drive in Finland's WRC-rally in August. According to Räikkönen Lotus isn't a stepping stone to Red Bull. - I have no plans in Red Bull's direction, Kimi assured. Räikkönen doesn't see Red Bull or Ferrari as any special challenge. - If one wants to do well then one has to win everyone. Ferrari hasn't been in the top for a few years. For me it's just a team among other teams.